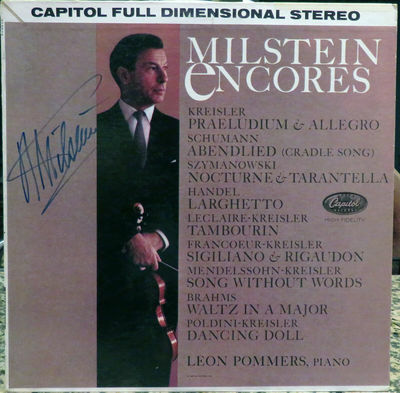 Nathan Milstein signed autographed "Encores" LP album. Record is Near Mint condition, cover in Excellent condition (tape upper right corner along seam). Pictures are part of the description. Kept in pet and smoke free environment. Auctioning my autographed record collection; check out my other listings. Payment via PayPal. Shipped with USPS Media Mail with tracking. Lower 48. No international.